It’s become somewhat of a meme that conservatives love to indulge themselves in the glory of American exceptionalism, as if America was the only country on Earth with freedom. Well, when it comes to freedom of speech and religion, the reality is that America’s governing institutions and culture truly are exceptional. Perhaps a bit of perspective is in order. A recent project by Pew Research explored support for Freedom of Speech and Religion around the World. What they found illuminates the disparities between America and the rest of the World when it comes to these fundamental liberties. A mere 35% percent of the population in the median country believe that people should be able to make public and offensive statements about other people’s religion or beliefs. In contrast, 77% of Americans support this right. Apostasy and blasphemy laws, while unheard of in America, are prevalent in many countries around the World. “Roughly three-quarters of the world’s 7.2 billion people (74%) were living in countries with high or very high [government] restrictions or [social] hostilities [on and against religious minorities] in 2014,” according to Pew. This is not the case in America, where society is relatively tolerant and freedom of speech and religion are guaranteed to every citizen by the Bill of Rights. Even relative to other liberal democracies, the United States boasts a government and culture which is much more supportive of free speech. In the Median European country, approximately 50% of the population believes that statements that are offensive to minority groups should be censored by the government. In fact, in Germany, 70% agree. In contrast, only 28% of Americans agree. 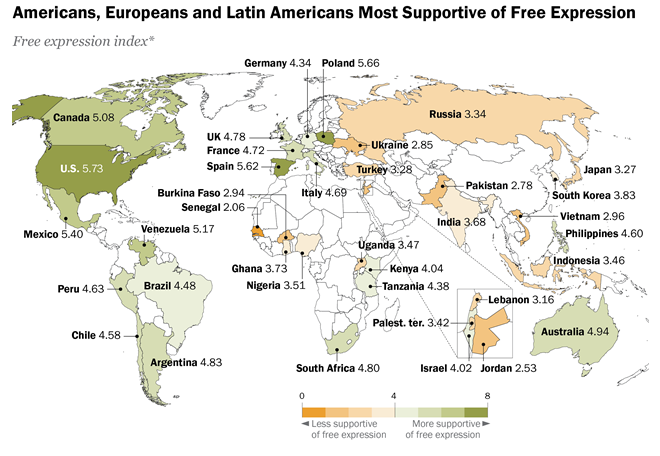 In fact, the United States ranked #1, being the most supportive of freedom of speech among the countries polled. Thus, at least in this respect, America truly is exceptional. Looks interesting – then I see Venezuela is more free the Canada in the area of speech. Seems off. Reblogged this on Empirical Anecdotes.